The purpose of this experiment was to determine the minimum concentration of chlorine that would inhibit 50% of the soybean germination. I became interested in this idea when I saw on the news that a lot of countries that have sanitizers for their water use chlorine to help purify it. A lot of the citizens will use the water that was previously purified with chlorine on their plants and maybe even their crops. Also soybeans are important to world agriculture and are a large part of the diet in many countries. The information gained from this experiment could help farmers, botanists and anyone who is involved in or has a job in agriculture. My first hypothesis was that the 10-milliliter chlorine mixture would prevent the 50% of the seeds from germinating. My second hypothesis was that the 0.625-milliliter chlorine mixture would not inhibit any of the seeds from germinating. I based my hypotheses on the fact that the Turkish Department of Wastewater Reuse filters use 1-milliliter to 5-milliliters of chlorine per liter of wastewater in the filtration process. Also the Turkish Department of Wastewater Refuse stated that using more than 5-milliliters of chlorine per liter should prove to have deadly side affects to plants. 1) The number of soybean seeds in each group. 2) The amount of light each group receives. 3) The amount of chlorine water mixture each designated group receives. 4) The environment the soybeans are grown in such as the temperature, and the humidity. 5) The type of container the soybeans are grown in. 6) The type of sand the soybeans are grown in. 7) The amount of sand the soybeans are grown in. The manipulated variable was the concentration of chlorine in the water that the soybeans were given. The responding variable was the percentage of germination of seeds in each group. To measure the responding variable I counted the number of seeds that germinated in each group. A. Label the first planter “Control”. B. Label the second planter “O.625ml”. C. Label the third planter “1.25ml”. D. Label the fourth planter “2.5ml”. E. Label the fifth planter “5.0ml”. F. Label the sixth planter “10.0ml”. 2. Labeling the water containers. A. Label the first container “Control”. B. Label the second container “O.625ml”. C. Label the third container “1.25ml”. D. Label the fourth container “2.5ml”. E. Label the fifth container “5.0ml”. F. Label the sixth container “10.0ml”. 3. Filling the sand planters. A. Measure out 30 ml of chemical free playground sand. B. Pour the sand into the first cup of the Control planter. C. Repeat procedures “3-A through 3-B” for each of the other cups in all the other planters. A. Plant three soybean seeds in each of the cups for a total of 216 beans planted in each planter. B. Be sure to plant all the seeds at least a quarter an inch under the sand. 5. Setting up the growth light. A. Attach a light to a shelf or a surface directly above the planters. B. Leave the light on all day and all night until the experiment is completed. 6. Mixing the Chlorine Solutions. A. Using the graduated cylinder measure out 3 liters of water. B. Pour the water into the container labeled “Control”. C. This is your control solution. D. Measure out 10 ml of chlorine. E. Measure out another 3 liters of water. F. Mix the 10 ml of chlorine and water together to create the 10 ml chlorine mixture. G. Pour the 10 ml solution into the 10 ml container. H. Repeat steps “6-B through 6-F” four more times, except replace thev10 ml of chlorine with the remaining solutions, 5 ml, 2.5 ml, 1.25 ml, and 0.625 ml. A. Water the Control planter with 10 ml’s of water from its matching water container. B. Repeat step “7-A” with the other planters but water using the planters matching water containers. C. Water the plants every day until at least 90% of the Control planter germinates. A. After germination of 90%of the Control group dig up the plants. B. Record the number of seeds that germinated. C. Create a table and graph your results. The original purpose of this experiment was to determine the minimum concentration of chlorine that would inhibit the germination of soybean seeds up to 50%. The second original purpose of this experiment was to determine the effect of various concentrations of chlorine, below the 50% inhibiting amount, on the germination of soybeans. → 90% of the soybeans in the Control group germinated. → 82% of the soybean seeds in the 0.0625ml group germinated. → 75% of the soybean seeds in the 1.25ml group germinated. → 72% of the soybean seeds in the 2.5ml group germinated. → 60% of the soybean seeds in the 5.0ml group germinated. → 46% of the soybean seeds in the 10.0ml group germinated. My first hypothesis was that the 10-milliliter chlorine mixture would prevent 50% or more of the seeds germinating. My second hypothesis was that the 0.0625-milliliter chlorine mixture would not inhibit any of the seeds from germinating. The results indicate that my first hypothesis should be accepted because 64% of 10ml group did not germinate, that was 54% worse than the control group. The results also indicate that my second hypothesis should be rejected because 18% of the 0.625ml group did not germinate, that was 8% less that in the control group. Because of the results of this experiment, I wonder if the soybeans were watered another group with 0.03125ml or 0.015625ml of chlorine would the results be better or worse, I predict better. I also wonder if I watered a group with 15ml or 20ml of chlorine how much of the group would germinate. If I were to conduct this project again I would conduct it outside in the summertime and I would water them more. I would also use more groups with more seeds. Also maybe use more soil. The purpose of this experiment was to determine the effect of various common household cleaners on fabric puncture resistance. I became interested in this idea because I thought it would be fun to see what some household cleaners do to clothes. 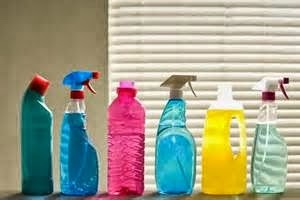 The information gained from this experiment could help people be more careful when using household cleaners. My first hypothesis was that both polyester and cotton treated with chlorine bleach would have less puncture resistance than untreated cotton and polyester. My second hypothesis was that both polyester and cotton treated with ammonia would be weaker than untreated polyester and cotton. My third hypothesis was that ammonia wouldn’t weaken the fabric as much as chlorine bleach. The manipulated variable was the household cleaner applied to the cloth. The responding variable was the force it took to puncture the fabric. To measure the responding variable I used a bathroom scale to determine the force applied to the cloth, recording the force at the time the cloth was punctured. 1. Build a wood frame to hold fabric pieces for testing. a. Cut two 12in. by 12in. squares from plywood. b. Draw a 9in. by 9in. square centered 1.5 in. from each edge inside the plywood squares. c. Drill a hole in each of the four corners of the inner squares. d. Then cut out both inner squares. e. Now use four clamps to hold the fabric pieces tightly sandwiched between the two halves of the wood frame. 2. Glue the two cut out 9 x 9 inner squares together in a sandwich. 3. Drill a 1 in. diameter circle in the center of the two glued together squares. 4. Then glue a 1 in. diameter rod about 5 in. tall into the drilled hole. 5. Next cut nine 12 in. by 12 in. squares out of cotton cloth and do the same thing with polyester cloth. 6. Now you have to soak the fabrics. a. Place one piece of cotton in a glass dish. b. Use the glass measuring cup to measure 180 ml of ammonia and poor it onto the cotton. e. Repeat steps 6.a–d two more times with cotton and three times with polyester. f. Then repeat steps 6.a–e with bleach instead of ammonia. 7. Place the puncture rod on the scale. 9. Using caution, apply increasing downward force to the fabric in the frame against the wood rod. 10. Carefully watch the scale readout. When the rod pops through the fabric record the weight the scale shows. 11. Repeat steps 8-10 with the rest of the non-soaked polyester and cotton. 12. Repeat steps 8-11 but with the ammonia group. 13. Repeat steps 8-11 but with the bleach group. The original purpose of this experiment was to determine the effect of various common household cleaners on fabric puncture resistance. The results of the experiment were for the controlled group, polyester punctured at about 90.7 kg. and cotton punctured at about 31 kg. For the ammonia group, polyester punctured at about 90.7 kg. and cotton punctured at about 28.7 kg. For the bleach group, polyester punctured at about 81.6 kg. and cotton punctured at about 13.6 kg. The results indicate that my first hypothesis should be accepted because both types of fabric were weaker when treated with bleach. The results indicate that my second hypothesis should be rejected because ammonia didn’t affect polyester. It did weaken the cotton. My third hypothesis was that ammonia wouldn’t affect the fabric as much as chlorine bleach. The results indicate that my third hypothesis should be accepted because bleach affected both polyester and cotton and ammonia didn’t. Because of the results of this experiment, I wonder if soaking the fabric longer in the cleaners would have affected the fabric more. If I were to conduct this project again I would use an industrial tensile strength machine so my data would be more accurate. I would also use a weaker fabric than polyester, like silk. I would also add another household cleaner. I would also add another natural fabric like wool. I would especially do more trials. Researched by -- Zach F.